When Chris Moneymaker won the 2003 WSOP Main Event, from a $39 buy in at PokerStars – he ended up creating what was known as “The Moneymaker Effect” – which was summed up saying “staying at home in front of a computer screen could be more profitable than going to work…” (a quote that came from an interview he did with Howard Swains in The Times). 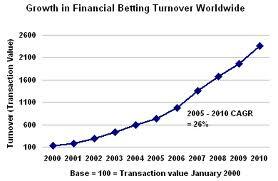 However, since 2003, online betting & gaming has become more and more commoditised, as technology and access to content becomes cheaper and more widely available. There are now many online betting operators that solely rely on 3rd party software to provide product experience and infrastructure – and solely concentrate their efforts on marketing by brand differentiation. You could compare (for example) the Titan brand that solely uses Playtech for all its products and infrastructure (Titan Poker, Casino, Sportsbook) VS Bet365 that has developed a proprietary platform for its sports-betting and then uses 3rd party partners for its egaming products. (Which has become standard operating procedure for the most successful operators). And simply hoping for a “Moneymaker Effect Mk.2” to drive their business may be a little optimistic. What’s this got to do with financial betting? The standard online betting operator (that’s either a market leader in a local terrritory, or has a global presence) tends to have at least 4 verticals. Sportsbetting, Casino, Poker, Games. In certain local territories, Bingo is also a staple and Live Casino is where there’s been massive adoption over the last 18 months. But why hasn’t there been more widespread adoption of some relatively simple, high margin financial type offerings, that can be easily integrated using virtually the same technology and infastructure as other online gaming offerings? I’m discounting spread-betting because the “hold” requirements are too high for the average man in the street. In the the UK, the average account requires at least £1,000 for any market activity, and that was the average amount attributed to a new account deposit by IG Index in 2010. The regulatory requirements in terms of KYC (Know Your Customer) and the documentation is a roadblock too. Paddy Power’s experience with offering a spread-betting & CFD product at a more casual customer base, seems to back up the assertion that it’s not a good fit for the classic online betting operator. For definitions of CFD’s see here – but it’s glorified spread-betting. (BTW – I’m actually a big fan of both product types, but I think that they either need to be re-packaged in terms of the “sell”, and targeted at a market segment that could be educated and walked through the process better.) There are opportunities available to potentially be disruptive in this market, as in many countries in Europe, the level of trust that was inherent in the financial advisor / banker / broker relationship – has been badly damaged by much of the economic fallout from recession. There’s another financial offering that I think is really interesting – and is yet to be exploited in the B2C market. That’s fixed odds binary options – which are simply a fixed odds bet where the customer decides where a thing (share price, price of a commodity eg: oil, gold, or index (Nikkei, NASDAQ) is going to end up higher or lower than whatever the thing’s price is at, when the bet is placed. (I love that I had to get technical and describe financial instruments as “things”). It can get more complicated than that, but that’s a fairly simple explanation. Wikipedia does variants in-depth. If you could tell a customer, that you can bet now on the fact that the price of (for example) oil, will be higher or lower in 5 minutes, 10 minutes, an hour or 24 hours – for as low as €10. It’s a fairly simple proposition. Binary options will allow people to bet on multiple indices, in low amounts, with a margin that’s set by the underlying market provider. Basically that means that the market maker (in this case an operator, or to be even more exact, the 3rd party that’s providing the operator with the binary product) can choose what price that they want to pay out on the particular index/commodity etc. So, for example – let’s say gold is trading at $100 an ounce, and I place a $10 fixed odds binary bet, that in 5 minutes that price will be more than $100 (doesn’t matter how much more), and in 5 mins, gold is trading at $101. I win my bet. But the payout is fixed at (for example) 70% – so I get paid out $17. If gold is trading at less than $100, I lose my $10. Looks like bad value for the customer (and at those margins it is), but it’s very profitable for the operator. The lack of value, can be more than made up for by the fact that it can be seen as a very low cost to entry to a “sophisticated” market – for a customer who thinks that they’d need to go through broker / equity / other to be able to do that. There’s some pretty complicated risk management involved for the market maker, but there are some great 3rd party companies out there who’ve got a solid handle on this already. I’ve talked to a few, and some of the up and coming ones have amazing technology. I think that they need to further simplfy their offerings, get some good B2C marketers involved, link up with established brands, and maybe they’ll start making further inroads with some of the larger multi-product betting operators. There may even be some left-field opportunities to develop relationships & binary white labels for companies that have customers who trade or who trade on their behalf – and are looking to be more active in their investment decision-making. The 24/7/365 mobile device enabled environment that we’re surrounded by today would allow consumer investors to react as quickly to newsflow and trade oil / commodities (in reaction to world events) using very simple up/down options – under this model. To make it competitive, the market makers would probably need to adjust their margins to give better value – but it’d sure be interesting to see it happen. You can see a “Play for Fun” example at ladbrokes, if you want to try it out. (Not a massive fan of their interface, but the brand postioning is ok). Could fixed odds binary options get the Moneymaker effect? Only time will tell. « Can I make myself trend on Twitter? I can with Eurovision. Douze Points.